Home Food Get Ready to Dine Way, Way Above L.A.
Just when you think Los Angeles dining can’t go any higher, we’re about to get a restaurant 71 floors above the downtown skyline. The aptly named 71Above will debut at the top of the US Bank Tower in spring 2016, a most ambitious project from hospitality vet Emil Eyvazoff, the same man who brought the first hi-rise restaurant and nightclub, Takami Sushi and Elevate Lounge, to the Financial District back when downtown was still growing as a hotbed of culinary scene. 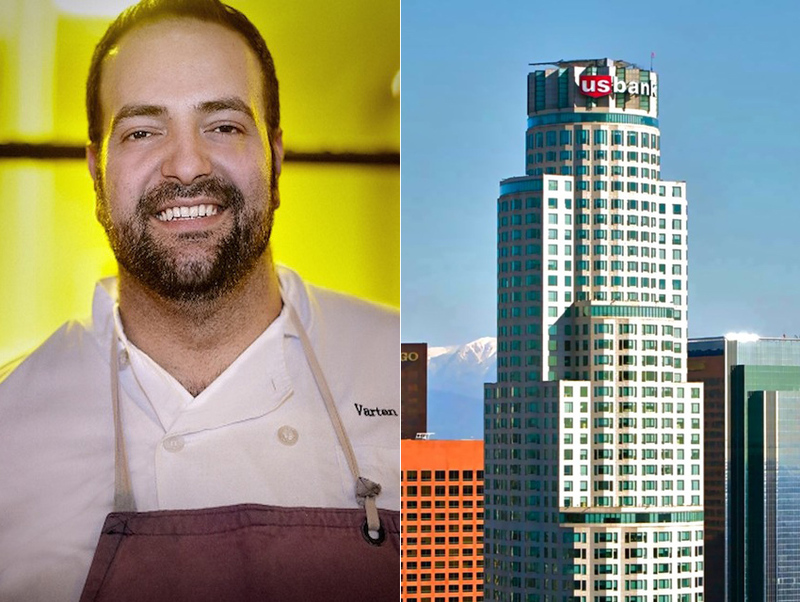 And before anyone thinks this is just another “view” restaurant, Eyvazoff enlisted chef Vartan Abgaryan, most notably of Cliff’s Edge in Silver Lake, to lead the kitchen. When it comes to dining with a view, there are a handful of options downtown, including Eyvazoff’s sushi restaurant, as well as Wolfgang Puck’s WP24 at the Ritz-Carlton at L.A. Live. There are the rooftops at The Standard and Perch, and the BonaVista Lounge, the revolving bar at the Westin Bonaventure Hotel. And while all have their charms and varying views of the skyline and beyond, none come close to 1,000 feet above the street. Talk about being on top of the world. The chef has garnered a lot of praise for his seasonal, modern cuisine at Cliff’s Edge, and while it’s difficult picturing the Silver Lake patio without his colorful dishes, 71Above was too good of an opportunity to pass up. The menu will be influenced by every facet of L.A., from the seasonal bounty to the different pockets and facets of the city. And he’s not just the executive chef; he’s also an owner. “This is very different from what I’m doing at Cliff’s Edge,” Abgaryan says. “Because of the huge multicultural diversity of this fantastic city, I have a lot of room to play with a huge array of flavors and techniques.” There will also be a master sommelier-curated wine list and craft cocktails to pair with his menu and the unparalleled views.